Set in northern Berlin’s green district of Reinickendorf-Wittenau, this family-run hotel enjoys easy transport connections to Tegel Airport, the ICC exhibition grounds, and vibrant city centre. 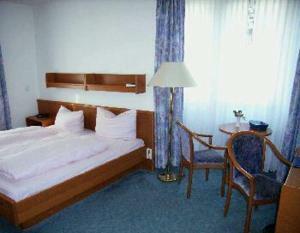 The Hotel Garni Wilhelmsruher Damm offers modern rooms with en suite facilities and free WLAN access. Free parking is available on location. The nearby city rail and underground station of Wittenau ensures maximum mobility. Treat yourself to a freshly prepared breakfast buffet at the start of the day.